My mom and I have a nightly ritual. Before I fall asleep I call her from Iowa, where I live, and chat with her in California, where she lives in an assisted living near my sister and her family. Because of the different time zones, and because she goes to bed early these days, we are both saying our goodnights to each other at the same moment. I ask about her day, and she asks how my husband, Tom, and I are doing. She loves Tom. “He’s such a nice young man,” she says. “And you are so happy together. ”Sometimes she gives me advice. “Always be nice to each other. Don’t be angry. Try to stay positive,” she counsels. What she said is true. There is research that the act of smiling itself can make you feel happier. Russian researchers are also discovering that the sound of positive words has a healing effect on the body, and can even heal the DNA. In the book, My Stroke of Insight by the Harvard-trained brain scientist Jill Bolte Taylor, Ph.D., the author talks from her own experience about the emotional and neurological effects of having a major stroke. She relates that one of the positive effects of her stroke was losing memories of stress and patterns of negativity. When she started to regain her memory, these patterns started coming back. So she worked hard to create new patterns. “The brain is like a muscle, she explained, actually becoming larger in the areas that are used more. The more you make a habit of reaching for the positive thought, the more your brain will automatically go there. Yet even though there is a huge self-help industry based on this concept—that thinking positively is important for our relationships and our mental, physical and emotional health—we also know that in times of pressure or stress, all the good intentions and positive thinking can fly out the window. We also know that straining to think positively when you don’t feel it inside can create a disconnect. Probably we’ve all met people who are trying so hard to be positive, but somehow it doesn’t match who they really are. The strain of trying to be someone you aren’t can actually cause stress to your own body and create discord in the environment. I think this is especially true for women — many of us try too hard to harmonize and be nice and sometimes end up feeling resentful, used, and exhausted. And then there are people like the Meryl Streep character in The Devil Wears Prada — someone who plasters a smile on her face even while acting maliciously can be downright scary. Because I feel more negative when I’m stressed and tired, doing Transcendental Meditation twice a day — which gives me deep rest and eliminates my stress and fatigue — naturally allows me to be more clear and positive in all my relationships. When you are dissolving stress in your meditations every day, you find your mind naturally thinking more positive thoughts about others, about yourself, about the future. 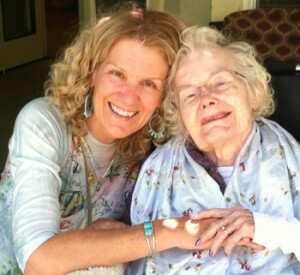 At the same time, I do feel my mom is right too — most of us can benefit from leaning toward the positive in our lives. Thanks, Mom, for teaching me how to live. And thanks to Maharishi for this beautiful technique that allows me to dissolve stress in my meditations instead of taking out my frustrations on the people I love.